Ed. Note: RTP Fit classes get going once again on January 11th! We have expanded our offerings, and now have free classes Monday-Thursday. Check out the RTP Fit page for full details. And, keep reading to learn how our intrepid intern, Nicole, felt about her first RTP Fit Yoga class! As I changed out of my pantsuit and into my yoga pants (which I typically wore NOT while doing actual yoga), I looked in the mirror and couldn’t help but think “well, I have no problem looking the part!” I threw my hair into a bouncy ponytail and pranced into my co-workers office. “How do I look? Ready for yoga? Do you think I’ve got them fooled! ?” She laughed and I waltzed out into The Atrium, expecting to find a sea of skinny women in expensive workout gear from stores with names I couldn’t pronounce. I spread out my yoga mat and swore I heard it breathe a sigh of relief at being unrolled for the first time in who-knows how long. As I watched people start to trickle in, I was pleasantly surprised at the diversity in the participants. Most of the participants had what I would consider “real” bodies. Not only were they all different shapes and sizes, but all different colors, ages, and even genders! Yes, out of the 17 participants, there were 4 men present. The last time that I had done yoga must have been at least 6 years ago. It was quite an ordeal digging my yoga mat out of storage, and I wondered whether that was more of a workout than the yoga session itself would be. Our instructor, Shauna Bowman of the YMCA, started us out with “Cat/Cow,” a pose I actually remembered. Light stretching, calming music, sunlight streaming through the wall of windows in front of me. Piece of cake. I was pleased when the music transitioned from zen flutes to “You Make Me Smile” by Uncle Kracker. Not that the initial music was bad, but it was good to hear a variety. As the session progressed, I figured out that my balance (which I had once bragged about…oh, the fleeting invincibility of youth…) was no longer what it used to be. Ok, I’ll be honest: it was non-existent. I cannot tell you the number of times that I fell over. “Don’t hold your breath!” the instructor chimed. How did she know? I hadn’t even realized I was doing it! And then I overheard every other person in the room let out a deep breath too. Why is it that we think our lungs are somehow connected to our equilibrium? The session continued, and I realized that I was sweating…in yoga! As Shauna asked us to grab each other’s wrists and form a line, I sensed a pang of guilt in forcing another human being near my clammy skin. I felt a bit like a world-famous-Rockette, and was delighted that supporting each other through the poses made them much more achievable. Eventually (and to my dismay) we switched back to individual poses. Each pose had adjustments for beginner yogis and more advanced yogis. At one point Shauna instructed for a more challenging pose “Maybe we’ll reach for the heels!” and I realized that my bold utterance “No!” had been more audible than I intended. Nonetheless, the encouraging participants laughed it off and we continued through the flow. Towards the end of the session, Shauna mentioned a pose called “the Twisted Camel.” My first thought was “Is that a cocktail!? Because it sounds like a cocktail and I could really use one right now…” Unfortunately it wasn’t, which was a good thing because my balance was iffy as it were. As the session drew to a close, I enjoyed relaxing in Child’s Pose. 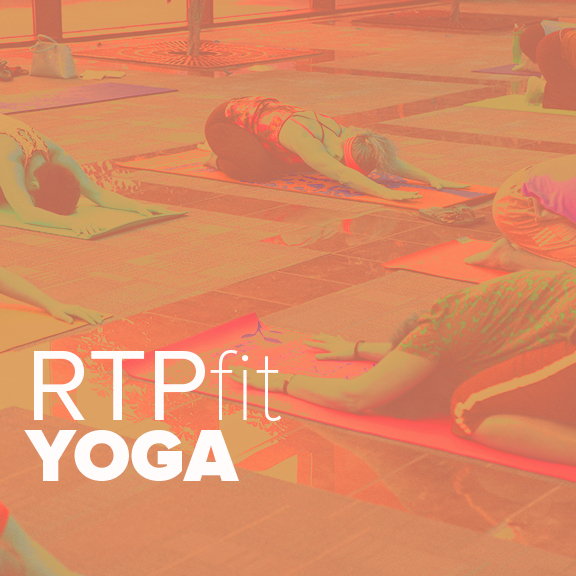 I pondered whether I would partake in yoga at RTP again, and I decided that I would. The session had been challenging yet relaxing, a great balance of stress-relief paired with a good workout. I also find that having the fitness opportunities right in front of me forces me into them, which is probably a good thing. Bring the right supplies. Technically the only thing that you need to bring is a yoga mat. They provide extras if you don’t have one, or you can bring a large beach towel as a substitute. I personally would recommend wearing something comfy, and something that you feel confident in. Definitely bring a water bottle, and a face towel and deodorant if you tend to sweat. Luckily, The Frontier has locker rooms, so if you’d like to shower after class, you can bring your soap and a towel and enjoy a nice hot shower before heading back to work. Take or make a friend. Your first session can be somewhat intimidating, whether you’ve done yoga before or not. If you can find a friend or coworker to come with you to class, that’s awesome! But if not, try to be social and introduce yourself to others prior to the beginning of the session. I found that this helped me to be far less self-conscious once class started. Don’t judge yourself. I was somewhat dismayed at my own performance in the class (we’ll call this “perfectionist-first-child-syndrome”). That said, the great thing about yoga is that it is definitely not competitive. It is important not to judge yourself in comparison to others, or even in comparison to another version of yourself. There is room for everyone in yoga, and Shauna did a great job at encouraging the class and reminding us of this. Share your RTP Fit experience with me by tweeting @NCTAY!